Is it only me, but doesn't the prospect of new non-geographical dioceses in the Church of England, to provide cover for those theological dinosaurs who cannot accept the leadership of women as bishops (get on with it! ), open up the likelihood that such new dioceses would become a structure by which all sorts of separatist GAFCON-like and loving parishes could organise themselves, a sort of gift of a Trojan Horse within? I realise that the folks of GAFCON are likely to start their invasions and separatisms before this slow coach to women's consecrations gets off the ground but, come on, don't make it easy for them, leaving the gravy on the plate. 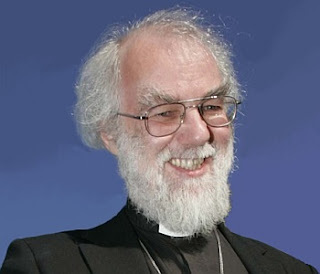 Through only an official, and by only an email, Archbishop Rowan Williams stoops even lower in his already well diminished stature as leader of the Canterbury Communion, in refusing Bishop Gene Robinson the exercise of presiding at the Eucharist and even preaching. Mad Priest via Mary Clara at Putney had the report on this, and then The Lead as part of Episcopal Cafe, and Dave Walker points out that an Archbishop cannot prevent someone from preaching. Nevertheless, as the Thinking Anglicans headline has it, Gene Robinson is showing respect for the Archbishop in a completely non-reciprocal fashion which does Gene Robinson nothing but credit. Once again the Archbishop promotes the religious bureaucracy, and hides behind the shabby all-knowing, all-powerful, all-omnipresent The Windsor Report and all else that is dragged along with it - that surely contradicts its own listening process when the man he isolates supposedly cannot even talk within the context of preaching the gospel. In all this the trees keep being counted but the wood goes unnoticed. What is this most like? The shabbiness and failing of the Roman Empire from within? The Roman Church before Luther? It is surely an institution going rotten from within. Afraid of the protestations of some, who will go off and form their own association anyway, the ongoin double-dealing will not treat Akinola (questions to ask about violence, a boundary-crosser), Malango (dismissed the ability of a court to try Kunonga for incitement to murder), and Orombi, Kolini, Nzimbi and, recently, the most spectacular Venables (all for boundary crossing), in anything like as equivalent to that isolation given to an honest man. Thus Christianity has been distorted, perverted, and turned on its head, all in the cause of a religious bureaucracy locked in fear and warped in confession. "Above all, pray for the Lambeth Conference," says the Archbishop. Better bishops? The Brazilian Bishops have responded to the more moderate St Andrews Draft of the Covenant, and have declared in resounding terms that it is completely unnecessary and even anti-Anglican. However, although acknowledging that commendable effort, we believe that our Communion does not need new instruments of consensus beyond those that historically have been our benchmarks in terms of identity. We have diligently studied the second draft of the Covenant, known as the St Andrew’s Draft, and despite some new insights shown from the first reactions to the proposal coming from various parts of the Communion, according to our view, the proposition is still problematic. The Covenant continues to be a mistaken proposal for the resolution of conflicts through the creation of curial instances absolutely alien to our ethos. Thus, inspired by this liturgical season and aware of the richness of our Communion, we manifest the conviction that the Covenant is not an essential element to maintain or strengthen our Communion; on the contrary, it risks defacing it. The Lambeth Conference has a task of pursuing the Covenant. The bishops have to sign up to the agenda. There are, supposedly, letters to go to bishops unhappy with this agenda, asking them to consider whether they ought or not to be at the Lambeth Conference, according to what extent they have problems with the agenda. Church after Church after Church is saying no to this Covenant. Letters should not be going to bishops with problems about the agenda, but to the agenda organisers, and to the likes of Rowan Williams and Tom Wright themselves. This thing is unravelling very fast. The Covenant is a fruitless and pointless exercise. It will never be allowed to be effective to discipline some Churches; it will only ever be words to add to already existing words (as the Brazilians say). Rowan Williams surely knows now that his attempt at centralisation, for the Communion to decide discipline as if there is something called 'The Anglican Church' is finished before it has even got going within that Conference. The so called Instruments of Communion delude themselves if they can decide anything, and certainly cannot decide new means to tighten up doctrinal boundaries. Already the Advent Letter has deluded too many on the Conservative side. They, and Fulcrum types, thought there would be a new dawn of a Communion, an effective worldwide fellowship of identifiable believers, and some centrist Catholics thought there would be an identifiable worldwide Church to present to the Roman Catholics and the Orthodox. Well, there is neither. Anglicanism is a loose association of Churches who have some things in common but which do not stitch up one entity. It is for the Churches themselves, each as each sees fit, to generate its ecumenical relations. As for GAFCON, let them get on with it. If they can stitch up their own Covenant, some sort of Calvinist type document, then let them get on with it and organise themselves. Then the breath of breadth might return to the rest of Anglicanism after the aberration generated by this current Archbishop of Canterbury, who stretched his wings further than they could properly reach in a repressive direction. This is very good; it did not just take ages to do - by Paul Bagshaw of the Modern Churchpeople's Union and its concern about the Covenant. It is a chart of the Appendix of the St Andrew's Draft showing its possible disciplinary procedure for Anglican Churches should some other Anglican Church or relevant part of the Communion think one Church is falling outside the terms of the Covenant. As pointed out here (100 years ago today) and here it is 100 years since Arnold Harris Ochterlony Mathew (1852-1919) was consecrated bishop (28 May 1908 - my blogging clock is 50 minutes fast) and subsequently came to the United Kingdom to form the Old Catholics here and whose main legacy became, by default, the Liberal Catholics (who broke away from him). Many in Anglican circles may well have forgotten about this minor figure for Anglican history, but he had a relative importance around Anglo-Catholics and was regarded as something of a nuisance by the hierarchy, leading on to an antagonistic relationship between Anglicanism and a semi offical view of Episcopi Vagantes, as they get called. It is a viewpoint I would reject, and regard as unwarranted. He was ecumenically minded, but his (never realised) potential was feared, particularly at a time of difficult memories around the rise of the Oxford Movement and an issue keenly felt about the Catholic legitimacy of Anglican orders. There is more on Arnold Harris Mathew here and also I wrote about him and much more. Here were some of his stages on the way. Interesting regarding today's Anglican controversy, he was always discovering homosexual activity and running away from it! Also not the pretty lousy encounters with the Archbishop of Canterbury, Randall Davidson. Wright wrong, Pluralist right. Probably. - says the Modern Churchpeople's Union Only Connect blog. Yeah, probably. The letters for bishops doubtful about a commitment to the Covenant and Windsor Process, and thus to examine whether they should turn up at Lambeth, were going out "presently" well over a week ago now. It depends on the definition of presently. Perhaps that video talking about the Lambeth Conference was instead of the letters - though why should it be? BabyBlueOnline, ever hopeful, passes on the report that it is not. Perhaps one cannot properly single out some bishops and not others who have doubts about the Lambeth Conference agenda: there are surely more with doubts about the agenda than some consecrators of Bishop Gene Robinson (who, actually, might be positive about the Lambeth Conference agenda!). I made the joke that the letter could go to all bishops so that they all ought to examine their consciences regarding the agenda. There is still time, of course, but the chances are now that the reaction to the premature announcement of the letters was such as to deter Lambeth Palace from sending out the real thing, assuming that Tom Wright was properly informed in the first place. Meanwhile, just to reiterate, I have no connections with Lambeth Palace or have any particular insight, and have never even been near the place. I have never met or heard Bishop Tom Wright. I have never met or heard Archbishop Rowan Williams. I have been to Bishopthorpe (York) twice, and did meet Archbishop John Habgood there, and in a rural parish church I frequented then, but that was back in the broader minded 1980s. I'm just a poor, marginal, boundary-crossing worshipper up in a lost spot of northern Lincolnshire, where two weeks ago someone or some people nicked one wheel from my car and left that part on a concrete block. The lecture called Evangelism in Western Post-Modern Secular Culture by Chris Sugden to the Anglican Network in Canada, Vancouver on 26/4/2008 puzzles me for the extent of its incoherence. At the start I cannot understand why it begins with the account of a call centre that ends finally with a consultant who knows less than the caller and why this should be explained as a function of modern western secularity. ...to secure our organisation, our borders and our future so that we may continue to reach out to win others for Christ. Securing borders sounds like something The Episcopal Church and Anglican Church of Canada have to do in the face of the attacks by CANA, AMiA and the Anglican Network in Canada. It is a process that tells us we live in a self sufficient immanent order - we do not need God to intervene for us. The focus of life, and of religion as part of life, is on finding fulfilment and authentic human experience. Doubts about religion are encouraged rather than addressed. Religion becomes one thing among others - not the thing that explains everything. Religion is a private matter. Religion is a continual quest for rather than a reception of and obedience to truth. Religious belief and behaviour are separated. Religion becomes a commodity, no longer a moral compass. The focus of religion itself is no longer on truth, because there is none out there, but on experience and practice. The space allowed for religion. Religion is allowed to operate in a closely regulated space, a space where religion is not allowed to threaten the assumptions of secularity. One wonders what is the agent of regulation here, what is allowed, other than a change in the sociology of knowledge. This approach can indeed be about creating truths through practice and experience, but practice and experience can also be about discovering truths. Really, these notes turned into a lecture are so rough and ready that they do not cover the territory and lack consistency. He says that the Anglican Network in Canada challenges this placing of the Church, but the Church of England did not present a challenge on the day he calls, into the typical sinister Anglican Mainstream obsession and fashion, "Gay Wednesday". This was when General Synod of the Church of England debates addressed Gay and Lesbian Christians as full members of the Church and Civil Partnerships. He complains that the experience-led basis of gay people and their relationships was not challenged by any bishop, even though (he says) it challenges the teachings of the Church and of the Bible. Some bishops even affirmed such relationships and called for recognition and accommodation. He thinks this is secularisation. Why is this secularisation? These are just relationships. He says people with gay relationships are prisoners of their genes, or their history, or of nature. Clever word is "prisoner": we are all made and constrained by our biology and by environment. Set against this, he says, is the biblical gospel of real moral choice, of responding to good and to evil. The biblical gospel tells us that Jesus brought the kingdom of God, that the one through whom and for whom the universe was created burst through the bonds of death and brought a new creation to birth through the resurrection. The biblical gospel tells us that through faith in the death and resurrection of Jesus and by the power of his spirit, we can be changed. We can be conformed to the image of the one who is the true image of God. But this approach is costly. It is costly because it challenges the very heart of the secularity to which our culture is committed. Well it is just another experience and another constraint; and this is not sufficient to alter deeply embedded biology and experience. Those who have revolutionary alterations to any kind of personal orientation are sometimes damaged, and they are rightly suspected, because there can be no thorough rejection of the past, only its building a biography of the self. The concepts of this religious faith, or any religion, cannot sweep away what has been built up. Of course he would say that this account is just secularity. It is called psychology: it is why we have secular disciplines, and psychology should inform the pastoral. The whole approach then is oppositional. What does not fit Chris Sugden's account can be binned as secularity, just as the mechanism of change is internally revolutionary. In that it is strongly anti-evolutionary, it is highly unstable. He thinks that secularisation separates belief and behaviour. There is mileage in this, because the plurality and complexity of modern societies is differentiation and specialisation. But then he jumps to adiophora, which he thinks came about as an Anglican method of separating out the trivial from the biblical essential, and as the Bible does not have the concept it should not apply within the Bible. So we will look eagerly to see in experience what Chris Sugden disregards in the Bible, skips over, conveniently reinterprets and the like. Adiophora is one means of coping with biblical contradictions, and doctrinal and communal developments therein through mythic and real time. Clearly some evangelicals have need of the concept. Then the lecture jumps to youth leaders and the Christian entertainment that leads to no transformation because it is experienced based. Back to the obsession again - that the incidence of evangelical young people living together without being married is no different from that in the general population, he complains. Then it jumps to a calendar and shape of liturgy, as God gave to Moses, and liturgy teaches people the gospel. He thinks that the 'free' approach to worship in liturgy and songs in many evangelical Anglican Churches in England today is also experience based (I have no idea about the relevance at this point of him mentioning supervising a Ph.D about Burma). Things then get interesting. We jump to Jesus preaching good news to the poor understood in physical categories of health and wealth disadvantage. Chris Sugden talks of the "possibility" of a truth that challenges the power of the powerful and the "possibility" that the ultimate power in the world was not Roman but the kingdom of God. Presumably he is into secular academic speak here: he surely means more than possibilities. Sadducee power was lost in legalisms, who did not want change in (?) the existing order. He quotes N. T. Wright positively, whom the GAFCON crowd increasingly dislike, in that those who believe in the resurrection are unstoppable because not even the threat of death deters them. Our witness to a secular culture is that it is possible to recognise and receive God's revelation, in spite of our human limitations, in spite of the fall. Far from God being like an autistic child who struggles to make herself understood to us, God links his revelation to a text accessible to all which has been breathed by His Holy Spirit. The Bible, he says, is transcendental in authority, not founded on or limited by human knowledge, "and therefore outside it". He exercises it [authority] of course through persons and institutions, the family and the church. Recognising the Bible as God's clear speech to us is not idolatry, because we do not become masters of the word. We are under the authority of the Word and expect it to confront us with new and even strange things. God does not reinforce our prejudices. One is liable to choke at this point. Not only does it reinforce his prejudices, but its use (one text lined up with another remote text, each often out of context, with massive cultural assumptions, transfers and actualisations - as within this lecture) absolutely smacks of the legalism of the Sadduccees. So the message of the church is that its own diversity, and ability to live with plurality and contradiction in its own membership on matters of faith is precisely its witness in a plural society. This is the stance of those who over the last decades and longer have been unwilling to bind themselves to any confessional formulae, and only recognise that the 39 articles have a historical value in illuminating what we used to believe. Such a liberal stance held the upper hand by defining the space, setting the boundaries and providing legitimacy for all the sections of the church who lived in a creative tension with one another. But the tensions and contradictions have become impossible to maintain together. Again, this simply is not so. Most even liberal Christians use and work with credal formulas (even if the Thirty-nine Articles were officially demoted). Liberal Christians do bind themselves, if critically, to the tradition. They are not Unitarian Universalists on a pluralist understanding! Ah! So here we have it. Obedience and disobedience among the poor. Something that at once seemed to be liberation, now looks like the E. P. Thompson account of addressing the poor and having right behaviour. It is - in economic and social terms - not an account of liberation and revolution, but of behaviour, and restraint into some nebulous salvation. Well of course it would not be uch a fuller liberation - after all, such would be "secularity". By claiming that all people were from one source, and all were saved in one new human being, even the Lord Jesus. Sorry - even the Lord Jesus was from the one source, even the Lord Jesus was saved in one new human being? It does not even sound Arian. I'm lost. people of the land where he started, robbed of their Jewish identity as the people of God by those who insisted on over rigorous application of the law: those regarded as outside of God's concern because they failed to live by these practices by reason of their gender or their race or their trade. Robbed of their Jewish identity? What is he on about? And as for those regarded outside God's concern, could we not do some actualisation of our own and add for today sexual orientation minorities, those robbed of their identity because of biblical selective literalist legalism? The frontiers then come to mean not geography but people of different roles and characteristics, as those that Jesus challenged. So now it is about finding those points in our society where people are affirmed or challenged by the gospel. The neighbourhood would be supported rather than tribalism. So then we have a Michael Nazir Ali point: that there are no-go areas in Britain. (Did he write this on the back of a postcard with points he must "get in"?). Then he mentions new mothers and children and goes on to teenagers as frontiers. The truth of God can be known, he says, as the gateway to fulfilling and fruitful life as men and women in marriage or celibacy (they really are obsessed); and that obedience and witness to that truth cannot be confined to the space or the form that is offered by the powerful. I am still looking for these powerful. It is like some international conspiracy against religion. Chris Sugden's lecture is a complete mess. It jumps around incoherently. He makes leaps of situation, culture, time and logic. He accuses others of stances they simply do not have. He creates opposites and there are no grey areas. He gets points in that seem to have no place. It continues with the sexual obsessions. It is all a kind of nonsense: a field of straw men, scarecrows of the far right evangelical imagination. This is New Puritanism. The Only Connect blog of the Modern Churchpeople's Union highlights an artificial battle between Vancouver's own Bruce Sanguin and Toronto's Rev. Gretta Vosper. The Sanguin (e!) approach is the more moderate, trying to hold on to and put contemporary life into the same language used by all Christians via a liberal interpretation of it, whereas Gretta Vosper is a critic of Christian language as well as a user. Douglas Todd, of the Vancouver Sun (Saturday, April 26, 2008) tells us that Sanguin prefers a yellow Christ and values a turquoise mystical Christ to the fundies' blue Christ and Vosper's orange Christ, the orange being thoroughly human and demythologised whilst the yellow one is about divine interconnectedness (sounds like a form of process theology). The colours come from the developmental studies of scholar Don Beck who talks about levels of human growth (and this has been done before: how, for example, the universalism of all things is a higher stage of development from a pluralism of clashes, itself higher than the concrete absolutes of fundies and undeveloped teenagers and younger). I don't care for these brain development ideas that link moving from the concrete to the abstract and then jump from educational theory into religion. The Vancouver Sun is right to show that Gretta Vosper is at the overlap between the faith path of the UCC and the Unitarians. Vancouver, incidentally, is a base for progressive West Coast Unitarianism as it features in both Canada and the USA (Unitarian Uiversalism), as developed by religious humanist Rev. Phillip Hewett in Vancouver who wrote very progressive interpretations of congregational development. It is when she comes to the topic of God that Gretta Vosper is a female Don Cupitt. She clearly thinks that the word God and its concept is problematic. She just about allows it to mean transcendence, but shifts it then to transcendent values. On the rest of it she might be the equivalent of John Spong, but it is on God she goes the extra distance. Her latest book title suggests as much: (2008), With or Without God: Why the Way We Live is More Important Than What We Believe, HarperCollins. The radicalism is scholarship-plus, the implications of a Jesucentric approach to ethical values, but one which refuses to turn the use of Jesus into an idolatry. It knows that the focus that Jesus had towards God was turned into a salvation religion about Jesus, and thus wishes to question even that move. Nothing, but nothing, is beyond questioning. We tell the stories he told. I stress that he lost, not primarily because he was crucified, but because the church rapidly developed a system that silenced what he was saying and created a theology of salvation and atonement, which was contrary to what he was saying. She said this in 2004 when Gretta Vosper launched the Canadian Centre for Progressive Christianity in Toronto. It is based in her church (and as such reminds me of the St Marks centre for Progressive Christianity in Sheffield - it is likely to be more politically radical and not quite as consistently theologically radical). We don't pray to a God who will grant our requests at whim. We don't know what happens. Sometimes our hearts are lifted when we join as people of faith and they connect in a way that is amazingly healing. There is something transforming in prayer that comes from within. It has to be said that that was then: once someone acquires a radical form of faith, it goes through many transient changes, so although she thought this in 2004 she will have changed. Anyway her book launch is on Monday evening, April 28, 7:30 for 8:00 pm at the The Multi-faith Centre, 569 Spadina Avenue, Toronto. The people of the land where he started, robbed of their Jewish identity as the people of God by those who insisted on over rigorous application of the law: those regarded as outside of God’s concern because they failed to live by these practices by reason of their gender or their race or their trade. Recognising the Bible as God’s clear speech to us is not idolatry, because we do not become masters of the word. We are under the authority of the Word and expect it to confront us with new and even strange things. God does not reinforce our prejudices. There is a struggle on the interpretation of scripture. I haven't seen his prejudices challenged, given the nature of selective literalism and the banging on with the one topic. The website is updated with publication here of the garage plans. I decided to lay off a website update showing these while the local authority was considering planning permission. The whole business has been like slow torture, beginning as a much grander double scheme and now just a single garage upgrade. 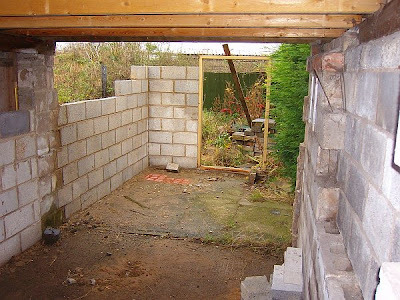 Normally planning permission is not needed for garage work attached to a house, but this garage is down the tenfoot somewhat and a technicality meant the need for planning permission. So now we are back to waiting for the builder to resume work. 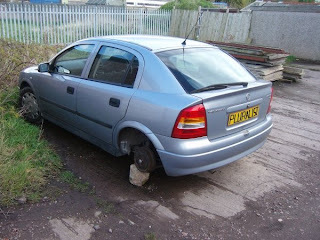 Over a week ago a wheel, just one, was stolen from the car. You can imagine how I felt about that, with the garage unavailable and would have provided security if it was available. Another picture is given at the bottom of the webpage about the garage plans. My own view about the latest words from J I Packer is that I have some measure of agreement with them. Meantime in our Anglican Communion the principle of geographical exclusiveness for the diocese and its bishop has been breached in a way that cannot be restored. It seems to me that where issues have become unbridgable there may well have to be a parting of the ways. There are two choices: obviously there can be a situation where the Anglican Communion in effect becomes an Anglican Church, and one with rules that binds in some decisions as legitimate and excludes others. It reduces the extent and range of any innovation, even where that innovation is seen by some as loyal to the tradition as a whole. Even at the moment the recognition that some Anglican Churches have for others is not uniform, and this relates specifically to the ministry of women as bishops and priests. Somehow this has been lived with, whereas the extension of the principle of inclusion to gay people has not been met with such a live and let live response. I think that scripture stories are meant to prompt us to ask what God was doing. I ask the same question: what is God doing not to the Anglican Church of Canada but the disorder that only seems to grow in the old west (US, Canada, UK, Australasia). We pray for an end to it but we do not see an end to it. I continue to pray that out of all this God is going to purge the old west of its poisonous liberalism which is weakening and shrinking the churches. God's way of purging is letting a thing grow to its full stature so that its real nature can be seen so that finally it is squeezed out. I pray that that will be the outcome of the inflow of liberalism. God is preparing and toughening us for specially demanding conflict. Now I think the substance of this is rubbish, but on the other hand if he and people like him do not want to worship and work alongside people like me I cannot make him, and indeed he is talking about a range of people far more comfortable with statements of orthodoxy than a clear liberal like me. As for the oversight of Presiding Bishop Gregory Venables, this is probably illegal even on the internal rules of the Church of the Southern Cone. It develops dioceses in ministries in clearly defined countries, and the United States and Canada is not in the list. Its ability to change this list requires a going to the Anglican Consultative Council, and it either has no view or a contrary view to what Venables is doing. Packer's joy at this oversight and bald statements about retention in the Anglican Communion may be short lived. Such should be the case for illusions of taking a diocese from The Episcopal Church and dropping it into his Church. Nevertheless Anglicanism is at a crossroads, and either it decides to find a point that satisfies the New Puritans, and institutes a new set of rules via an effective Covenant (likelihood - nil: not without seeing many Churches opt out), or it goes the way of multiple Anglicanisms in any one geographical area (which, with continuing Churches, is already the case). In one sense GAFCON is meeting too early: it wants to set an agenda but it won't be able to react to the tendencies of Lambeth 2008. The likely action for an ending of geographical monopoly will come from there, whatever it says about not being a schism from the Anglican Communion. At the very best, what is likely is an outcome of a small Global Anglican Communion, more like a Church of say seven provinces plus adventures into others, and a Canterbury Communion that cannot institute a Covenant except on the weakest of terms - a failure, in other words, of Rowan Williams's policy and hopefully followed by his resignation. Alternatively there could be three, that is a GAFCON set of provinces and adventures, a Covenant that would make the likes of Fulcrum happy, and a rejection of such a Covenant either leading to another one or just fraternal relationships. Such a break up would also probably lead to Rowan Williams's resignation, as it would be better even for the Canterbury Communion to pass to other hands. The alternative is to let GAFCON get on with it. Its members are not as successful as they would like think, and unlikely to be so. They have rubbed up too many people the wrong way, and it is geographically centred in Africa with adventurism among the New Puritans elsewhere. The Anglicans that are elsewhere, freer to innovate where possible, are those that could set up an autocephalous understanding of Churches, still meeting to discuss and compare notes at Lambeth every ten years. They might actually find a stronger unity between them on the basis of their autonomy, than forcing a unity that then leads to division - which is all that this Covenant will achieve. No one can fail to be concerned and saddened by the continuing suffering and strife in Zimbabwe; clearly there is another bout of repression now that intensifies what has taken place before. Churches want to show sympathy and solidarity through prayer, and through comments like this one from Bishop Desmond Tutu. My take on this is slightly different. Why is it that a regime like that, which is again unleashing another terror , goes through the merry dance of elections in the first place, even ones that are bogus? Having gone through them, how is it that they don't just announce victories, but pause, have no results, and only then start to stitch up results by apparent recounts and the like? The answer is because politics is still in operation, and power is not quite as certain as it seems. It has been clear that not all of ZANU-PF was united, and there has been a small independent breakout of a sort. The ruination of the economy bears down on the ruling party and the sustainability of power, on top of the age of Mugabe and the biases of the people on whom he relies. Approaching these elections, in a situation of legal and extra-legal repression, there was a degree of uncertainty about his power and standing that allowed something of the dance to take place - and when the result was so obvious, that he had lost comprehensively, and even allowed a narrow majority for the opposition in parliament, the whole thing went into pause and puzzlement about what next. What seems to have happened since is that Mugabe has rallied his forces. Enough people at the political centre see themselves more threatened by a change of power than by the continued ruination - at least for now. There are also gangs who can get food and provisions and have to go around causing a terror. Enough people getting the benefit and causing mayhem keeps the present centre where it sits. Still, Mugabe did this before: he destroyed places where people lived and he injured and he killed - and for a while then he produced a terror that reasserted his power. This option, though, becomes more limited the more it is carried through. Once this level of suffering and ruination passes, nothing will have changed. The South African position is, of course, deplorable, and it has lost international standing by continuing to treat Mugabe as "one of us" - though the unions not landing the Chinese ship of armaments have shown a more in-touch contact with the country as a whole. Other African regimes are becoming frustrated with the embarrassment of Mugabe - but many of these are corrupt to some degree and fighting their own internal battles. The coming change in leadership in South Africa may help. In the end none of these will matter set against Mugabe's ability to use enough people around him to spread a terror and keep control for now, and dull down those who would create doubt about his abilities, and his ability still to overcome spaces and places that can be exploited by forces of opposition. What he wants is to fix the present situation, and attach the label constitutional to the outcome. This is, though, a thin veneer. It sometimes suits a regime to have the appearance of an opposition to therefore have an appearance of legitimacy, and others wider and abroad can latch on to that for their own purposes. Zimbabwe though has real opposition, and this election has fooled no one - that the Mugabe regime remains uncertain. The clock is against him and the whole regime. An effort is still being made to twist the election to call a favoured outcome constitutional, and that is more the measure of his weakness, as is his effort to link the organised opposition to colonialism. Legitimacy and authority is increasingly out of Mugabe's grasp, even if he does twist the election. Too much has gone on and the stalling has been for too long. One puzzles why leaders want to stay in power when the country they rule has gone to rack and ruin; others quite close to Mugabe will wonder precisely that. There is another side issue here about which everyone is well aware. It is the couldn't care less attitude of the Chinese regime. It is as if the Communist Party of China has read its Marx on imperialism and, along with its introduction of the ruthless bonded capitalism at home has decided to do economic imperialism abroad without any moral compass at all. It trades with any regime regardless in the pursuit of getting its raw materials. It too is noticing some limits to this - the Olympic Games with its ethical dimension is rebounding in the Chinese regime's face and indeed these arms are going back. What a disgusting regime it is, rotten to the core, generally corrupt, and an upholder of human rights abusers around the world. I see that the MCU blog (see, I look at it) has done a late update that the letters are going out to Anglican bishops around the world who may have difficulties with the Covenant agenda of the coming Lambeth Conference. A spokesman for the Archbishop of Canterbury, Dr. Rowan Williams told The Church of England Newspaper that letters affirming support for Windsor and the Covenant process had not yet been mailed, but would go out presently. The rest of the report is based on the Archbishop of Canterbury's Advent Letter. We do not know that these letters will reflect in a fulsome way the disciplining content for which these evangelicals hope. No doubt letters of some intention will go out. The point is they have not, yet, still, and all they have to be about is discussing unease with the Lambeth Conference agenda. Nor does anyone see the absurdity within the process, that the letters if too strong risk denying the very sorting out that a mixed gathering at Lambeth would allow. In any case the outcome of the contents of a Covenant is not fixed, especially given the St Andrew's Draft and that such a draft with the possible appendix would not get past many Anglican Churches. The Advent Letter was written to impress, and in itself is an appalling document of pseudo-Catholic centralisation and fundamentalist biblicism wrapped into a ball. It has not a cat in hell's chance of being the outcome of anything unless forced through by the craftiest of managers, and no chance of being taken on board by many Churches (provinces). The danger is the utter mess that becomes the outcome, that both looks like it constrains and does not constrain and leaves something in place worse than the present situation. We don’t want at the Lambeth Conference to be creating a lot of new rules but we do obviously need to strengthen our relationships and we need to put those relationships on another footing, slightly firmer footing, where we have promised to one another that this is how we will conduct our life together. And it is in that light that at this year we are discussing together the proposal for what we are calling a covenant between the Anglican Churches of the world. A covenant. A relationship of promise. We undertake that this is how we will relate to one another; that when these problems occur, that this is how we will handle them together, that this is how advice will be given and shared and that this is how decisions and discernment can be taken forward. What I would really most like to see in this years Lambeth Conference is the sense that this is essentially a spiritual encounter. A time when people are encountering God as they encounter one another, a time when people will feel that their life of prayer and witness is being deepened and their resources are being stretched. Not a time when we are being besieged by problems that need to be solved and statements that need to be finalised, but a time when people feel that they are growing in their ministry. In other words, even allowing for understatement, not a lot of new rules and a spiritual encounter. There may well be an outcome of adding quite a few rules, but, as seen, too many and it won't get past the Churches who have already said a no or cannot do. The danger of a mess - an outcome beyond Lambeth that is not enough to be effective, but too much of a change to be affective as was - is still very likely. Liberal Catholic is meant here in a general not denominational sense, although if there is an overlap then all to the good. By necessity liturgy or practice is narrower than theology. It is liturgy that is the carrier of ritual and it is exchange and gift ritual that connects individuals and groups into binding purposes along with expressions of the divine. Theology may be narrowed by liturgical practice, but it can also lead to the widest possible connections. Both liturgy and theology are linked to narrative; liturgy need not be linked to historical method although it can be; at some point theology should connect with historical method when it discusses matters of historical importance (even to find them lacking). It can declare even central liturgical events as historically unavailable but can continue to theologise on wider meanings of liturgical practice. The Church practises liturgy and draws in theology in the task of describing its faith. The Church has the right to maintain and to change its faith and to associate with other philosophies and beliefs in the pursuit of some definition, as it has in the past, as it inherits from past cultures and changes with new cultures and plausibility paradigms, but it also should respect the intelligence and speciality of individuals and groups within to theologise themselves and give their own expression of faith. The Church may wish to propose the least possible practical definition to give more space to members, or simply propose itself as an arena for plurality of understandings, as it oversees liturgical activities. The Church may seek connections of legitimacy and authority through shared methods of recognition of authority and inheritance, in order that it is an entity, although it may then wish to subvert the more traditional implications of such authority structures in terms of operating in a self-limiting manner. The Church should decide freely with which other Churches it wishes to associate, if any. It should not be afraid to adopt and adapt insights from other Churches. What makes this Liberal is the commitment to freedom and breadth; what makes this Catholic is the importance of a liturgical approach. On 8th April 2008 Changing Attitude reported actual violence carried out against the Director of Changing Attitude in Nigeria, Davis Mac-Iyalla, and against the leader of Changing Attitude Port Harcourt. It also reported homophobic threats of violence against Davis Mac-Iyalla and the Director of Changing Attitude, Colin Coward. We emphatically do not believe that the GAFCON leadership team incited this violence, is in any way directly responsible for it or supports it. However, we strongly believe that there is a danger that the perpetrators feel encouraged or justified in their actions by the sometimes strong anti gay language coming from the GAFCON supporters within the Anglican Communion. It would therefore help enormously if you could recognise that this is happening, and that because of your strongly anti-homosexual theology it is particularly important to stress, loud and clear, that your opposition is held on purely theological grounds only, not because of personal feelings of hatred or dislike. We would very much welcome a statement from GAFCON confirming that, like all Christians, you deplore any form of anti homosexual violence. Such violence is completely against Christian values, is not what God requires from us, and diminishes everyone. We would like to remind the GAFCON leadership team that the Windsor Report states that theological opposition to homosexuality is to go hand in hand with listening to the actual experience of gay people, not in order to be converted to a liberal view, but in order to understand our homosexual brothers and sisters better and to recognise them as true brothers and sisters in Christ. Archbishop Henry Orombi (Uganda), Rt Rev Don Harvey (Anglican Network in Canada), Rt Rev Wallace Benn, Lewes (England), Rt Rev Martyn Minns (CANA, USA) Canon Dr Chris Sugden (England), Rt Rev Bob Duncan, Moderator, (Common Cause, USA), Archbishop Greg Venables (Southern Cone), Archbishop Peter Akinola (Primate of all Nigeria), Archbishop Emmanuel Kolin (Rwanda, Provincial Secretary), Archbishop Peter Jensen (Sydney), Archbishop Benjamin Nzimbi (Kenya), Archbishop Justice Akrofi (West Africa), Bishop Michael Nazir Ali (England/ Pakistan). Earlier in the week at Fulcrum and highlighted today on Thinking Anglicans it is clear now by reference to previous articles that by Super-Apostles Bishop Tom Wright of Durham was referring to the GAFCON leadership. It is still unclear from the Fulcrum lecture alone (at least to me) but not when all the comparisons are made back in the literature, so to speak. Still no letters have gone out, and here Baby Blue Online said the operative word from Lambeth Palaces was "yet" (that is, they they exist but have not gone out), and I said the operative words were "whether and when" which means they, if they exist at all, may never go out. In fact Baby Blue on Friday started having a great debate about the letters. I think I'm rather better at mimicry, even if I say so (the word "gotten" would never pass his lips, and that's just to begin). This point about nothing sent has been focused upon by Charles Raven. Bishops attending the Lambeth Conference will be asked to affirm their willingness to abide by the recommendations of the Windsor Report and work towards the creation of an Anglican Communion Covenant. I've mentioned Charles Raven before, and it seems that as an ex-Anglican he is evidence of what happens when su ch an evangelical gets cut off: he now makes reference directly to Richard Baxter (both are of the Kidderminster area). Oh do be careful - so do the Unitarians even to this day refer to him on an invented tradition of a broader Puritanism, whereas I would say the Unitarians are in part the unintended consequence of the Puritans reliance on the Bible alone. It ain't so certain, that book. The focus is on Paul and his pain in writing to the super-apostles, as in the wrong way around double letter called 2 Corinthians. The problem is, says Charles Raven, that the letters haven't gone out, and such does rather deflate the whole thrust of Bishop Wright's lecture, or at least it does in that the letters are to not the super-apostles but those on the theological left who would need to be disciplined in order to parallel Paul's pain. He also dislikes the association of GAFCON and false apostles (and it was why I thought, trying to observe evangelical-speak, that the super-apostles tag was being applied to the North American leaderships). It seems to me that Charles Raven would be more accurate than Tom Wright in this respect, regarding the super-apostles, if one was to follow evangelical-speak and the tortured connections that the arguments make between people who do no more than love each other and selective textual literalism. The having a go at the GAFCON super-apostles by Tom Wright therefore remains, and clearly is still a hot topic for the evangelical world, and the Wright lecture focused then on the ownership of the title evangelical. There was, as Graham Kings points out, the brother of the Archbishop of Sydney, Phillip, who had said evangelicals to keep their credentials should not mix with those who might receive letters at Lambeth. Presumably if they receive the letters and stay away then the more extreme evangelicals might turn up at Lambeth. Bishop Wright, and those of the Fulcrum persuasion are, of course, going anyway. The attractions of a middle way are now a forlorn hope. The crisis in the Anglican Communion is such that only GAFCON has the potential to articulate the vision of a stable and united global Anglican Faith. Well this is the case ever since Anglican Catholic traditionalism collapsed and was sidelined, and that the Church of England became a dyad of, basically, two wings with a yank to the theological right. For me, the Lent lectures by the Archbishop, and even the one on business and spirituality (though that was better) show how he has lurched to the theological right and parodies some of the historicisms of the evangelicals. The problem is that the broader Fulcrum position is not designed as a centrist position, nor do its arguments (such as indeed combining 1 Corinthians 15 with Romans 1) produce a position that draws in opposites. Rather it has a position roughly where the knife cuts between two evangelical wings. The Fulcrum position is the dividing point, and it has to decide whether it goes with the more critical spirit or the more doctrinal spirit. The difficulty now is that the Broad Church, Inclusive Church, and, more markedly than before, the Modern Churchpeople's Union, have become part of the left. Affirming Catholicism are now a form of spirituality with a tradition that allows a critique, which could play a centrist role, and would like to be, but even it is on the theological left given the recent shifts and decline in breadth. People locally know that I have some strange viewing habits. I won't go into why. I watched a talk given by a certain David Pawson one evening, looking more elderly and emotional than his usual self-assured presentations, but still full of detail, who, speaking to a bunch based around Revelation TV, made a point about evangelicals becoming Marcionite, and thus he accused Steve Chalke. That was quite a hefty charge to make, and more than the usual one that he has given up on the bloody atonement. Evangelicals are very divided these days. The tragedy of Tom Wright is that the more he fights, the hotter it gets. He has no sympathy from the liberals, from either what he says or from his approach to The Episcopal Church, and he has less and less empathy from such further out evangelicals. At some point the knife, or axe, will strike approximately where Tom Wright stands. It may be that the Anglo-Catholics had split over women and now it is the turn of the evangelicals over gays. Except, for the most part, the evangelicals who are split from are as anti-gay (in ministry and blessings) as the others who are on a course outwards. Nevertheless, once the split has happened, the evangelicals within will be all the weaker, and they will be to the right of a shrunken Church - depending on how successful or not is GAFCON. (quoted by Rowan Williams as of page 3). The idea of the book (which Williams only loosely introduces) is that both human beings together and the planet itself are stakeholders in the economic system. There stakeholders do not just seek profits but the common good of sustainability; to then meet the demands of the stakeholders requires three types of capital in general - material, social and spiritual - and three kinds of human capital where intelligence - IQ or rational intelligence and EQ or emotional intelligence survey and understand the current situation of materialist profit-making and SQ or spiritual intelligence that moves business on to the common good where business transforms how it behaves in its core activities and further carries out goodwill enhancing projects for the wider community. Williams does not say this, but whereas New Age spirituality is associated with consumerism and choice, this spirituality clearly is associated with production and notions of integration and community. It follows a whole line of business and organisation literature concerned with methods of empowerment where there is overlap with sociology (Weber and afterwards) and, inevitably, rationality, efficiency and secularisation and, later, pluralism and empowerment. Williams uses this book, and other statements drawing from the same well about spirituality, to ask about the difference between spirituality and religion. He questions whether this spirituality in bringing corporate cultures to nobler ends can ever actually be more fundamentally a critic (as when necessary), and maintains that it needs an agent for change, such as the action of God, which can therefore alter the stance of a believer quite radically compared (and contrasted) with the world. He sees the motivation of post-religious spirituality as a protest against external authority, which is hardly about business operations, where exercising spirituality is arguably the manipulation of authority, just as is an emphasis on empowerment that still fulfils corporate purposes (against what that sort of empowerment when people go on strike). This all might actually make his point, that without a strong ethical source spirituality becomes something vague put towards manipulative uses rather than as a positive critique. Or it might make his point so far. He seems to need an active agent, as found in the revelation of Christianity - but it is equally possible (and he should know, given much of his method) to have an ethic sourced in a strong narrative that can present a critique and action as well as notions of bringing together. After all, Marxism did this - Marxism that was hardened by imagining itself as an identifier of processes of historical change. The point is that there are sources of ethics, and some can be quite challenging. A green ethic, for example, demands investment that short-termism would resist. It can turn consumerism around, say to smaller vehicles and more efficient transportation than having larger and more isolating cars. Of course corporations grab the green message to smother it and turn it into marketing. There may be no ethical operation for the likes of McDonalds (he gives as an example) in that such an operation cannot just absorb a spirituality to meet the common good. But, actually, it is subjected to hefty ethical criticism already, and whilst it has slightly altered operations it could well be one of those businesses that cannot ever inhabit an entirely satisfactory ethical space. How can we know whether it does or not? Well, we cannot, except ethics are rather like Law. They reflect the collective coming together of pressures that derive from conversations about ethical predicaments - in the McDonalds case about agricultural production and opportunity cost of land use, world movements of food, obesity and food poverty, about sameness and predictability (the ideology of McDonaldisation), and about low level trapped employment. The ethic that arises as a critic may be various and multi-sourced, but variations and disagreements bubble up to transient consensuses about what needs to be done. Some of these ethics are indeed 'owned' (where we are patrons rather than subscribers), though again ideology is pervasive and clever, that we can end up thinking we own that to which we in fact just subscribe. This is the extension of empowerment within and outside corporate walls, and it can be crafty. It is less about secularisation. After all, if the business and organisation world is the focus, then the Weberian rational and disenchanting tendency produces soulless and top down institutions that cannot take account of the complexities of technology and specialised education and training needed today. In other words, businesses have to empower to some extent in order that people can function in complex high value output organisations. Only in some organisations do these trends go backwards: for example, the National Curriculum removed the relevance of the expertise of education theories among educated and trained teachers and turned British teachers into disenfranchised factory workers of already set syllabuses and recorders of quantitative assessments - behaviourism for statistical returns. The more advanced approaches use systemic and human relations authority, where there is real decentralisation and change from below, where managements have to be communication systems up, down and across. So secularisation gives way to pluralism anyway, if a co-ordinated pluralism, and that corporate pluralism is subjected to interests and is not even and free. This was the point of Jurgen Habermas and his communicative rationality, and distortion by economic interests. Rowan Williams' interest, of course, is a defence of Christianity and what is within it as an agent of ethical change, a sufficient critic as well as purveyor of higher values. What puzzles me about his argument is the lengths he goes to get to it, in that despite all the narrative references he has revealed himself to be someone who is at heart a doctrinal and historical believer. If this is so, then all these values and other sources of ethics, or wafty spirituality, however worthy, can be shortcutted to what he thinks is actually true, and true in a traditional sense. But he still wants to present the argument in terms of narratives and resources, such as the change in Jurgen Habermas when he acknowledged that traditions supply narrative resources towards producing the common good, which he had previously limited to disinterested, modern(ist) rational argument. Rowan Williams is, apparently, like any historical believer. He said that the bones had to disappear into the transformation of the dead Christ into the person who visited the apostles. It has to be historical, otherwise he would stop celebrating the sacraments, give up being Archbishop and recommend no more archbishops. Well this is not about narratives and resources, but about others being plain inadequate and even wrong. Culture has moved away from the overarching truth it surely had properly observed, say in the Middle Ages. Rowan Williams is becoming like Friedrich Schleiermacher, reaching out to the cultural despisers of Christianity, though Schleiermacher probably had more of a core sympathy with his reaching-out arguments, and so did Tillich who reached out with translations into existentialism that was also his mode of understanding the objectivity of Christianity. Somehow (and I've changed my view here) Rowan Williams has a shadow argument (narrative, story) that masks his real argument (empirical history). Either that or narrative and resource is his real argument, and he has been playing institutional politics with ideas ever since having "the job". He may think that history and narrative are combined, and of course they must run together (even empiricist historians interpret) but the point I am making is the core of this. It is not in some narrative that gives meaning, but in an empirical event that he cannot access that needs to be told. My own view is similar to Williams's regarding narratives without any extension. There is no universalism. Each univeralism is another addition. For example, John Hicks' universal theology of the Real (transcendence) has to avoid description or it is just another creed. This does not mean an absence of ethical agents. There are plenty of ethical agents. Indeed there are plenty of institutional sources of the unethical, for example the traditional Church and its unethical stance against homosexual persons and inclusion. Christianity is not a one-way transformative, it also holds back from what has become ethical. So everyone has to attach to some sort of defined ship, and there is some sort of identity there. I used to argue that these could be brought into a market space that was Unitarianism, where people of difference could worship together - and then Unitarianism acquired a kind of half-identity that put it exactly into the same muddles as found within liberal Christian attitudes to creeds and the like. Spirituality in a pluralistic Unitarianism had to be built up, to be rich and symbolic, and let the symbols fly off in all sorts of directions (whereas in reality it was an emptying out Puritan shadow). The alternative is a better defined spiritual path, with its artistic riches, and I have done that in Western Buddhism and in Anglican Christianity (where I had started out a pathway commitment). Neverthless, that attachment must be light and critical, and not to be strangled by doctrinal statements. We are all now capable of being theologians to some extent, and the right to interpret can be decentralised - and if not it will be taken. I can read the same material as Archbishop Rowan Williams; he might be better resourced than me but I can argue with him much of the way, and certainly on methods he is becoming inconsistent. One problem of course is that when someone gets into a pulpit there are many of us who just want to argue the point, and the whole method of Christianity is top down and timid when it comes to people and involvement. Anglicans cannot move without a bishop's licence and the whole system is disenchanting itself: Weber's rationality was a secular echo of traditional Christianity. Whereas, given his historical stance, he may as well say there is a reality like a spiritual wind that the believer may as well just be blown along within. My view is more narrative, that liturgically we join the drama from which the active sign and symbol system today is much more plural, that it is but one expression of 'spirituality' and that the ritual of the Eucharist relates to all those dramas of joining one with another. Corporate culture knows this too: its is why so many corporations have rituals of belonging. The point about the Eucharistic ritual is that it represents something in the world but not of it, a stance of reflection over all, and indeed a critique, but we are also critics when participating in it and the institution that presents it. The Jewish culture, the Greek culture, the Middle Ages and the Reformation, the Enlightenment, Modernity and post-modernity are all resources that come to us collectively in that ritual and for which we are renewing critics, among the other practisers of spirituality who have their own rituals. With my meeting the Joint Standing Committee and the unclarity still around the invitations to the Lambeth Conference this year, we resolved not to discriminate against any bishop of the Anglican Communion, in that the argument could not be made that the consciences of bishops are known only within the list in preparation, and thus it was considered not to send this letter to some bishops according to the incomplete and expanding list, but to all bishops eligible for attendance at the Lambeth Conference. As the person making the invitations, or withdrawing the invitations, I have considered what was this resolved recommendation of the Joint Standing Committee and, after taking further advice, I have taken a decision to agree to this approach. Therefore, as you are a recepient, I am asking you to search your conscience and how you are inwardly disposed and ask that if you have any concerns about the agenda of the Lambeth Conference that question your commitment to the Windsor Report and the Covenant to consider whether you ought to be coming to the Lambeth Conference at all. This is being asked of everyone of ecclesiastical invitation, and that in the spirit of inclusivity I have further asked it of myself. I should point out that at this stage I have not made a decision whether or not I should or should not attend and I shall be taking advice on this matter. The issue which now concerns me and all bishops was laid out by me in the Advent Letter of December 2007. I remind you that the Covenant seeks to engage all dioceses in provinces into the full membership of the worldwide Anglican Church. In summary form this is the common acknowledgment that we stand under the authority of Scripture as 'the rule and ultimate standard of faith', the common acknowledgement of an authentic ministry of Word and Sacrament, that we are able to recognise biblical faithfulness and authentic ministry in one another as provinces (administrative units), what we believe we are restricted with respect to blessing and sanctioning in the name of the Church, that one part of the family cannot make a decisive move that plainly implies a new understanding of Scripture that has not been received and agreed by the wider Church, and that the whole structure of mission and ministry will have failed in a local church that commits itself to a new reading of the Bible, and that how we read the Bible is based upon expectations of one diocese upon another across the provinces. It is through this that we preserve a theological monopoly of the worldwide Anglican Church over particular geographical areas through the dioceses and provinces, that each part maintains confidence in the other part. Unclarity has existed on this matter: of course expectations exist from one province to another, but these expectations must exist also from one diocese to another, the core units of the Anglican Church, and it is on the basis of this argument that this letter is now going out to every bishop of the worldwide Anglican Church. There is a misunderstanding, which is to some extent due to the over-influence of Internet chatter ("weblogs" and the like), but also perhaps a more general misunderstanding, that the purpose of the Lambeth Conference is not to exclude the unlikeminded, even though the discussion as to the nature of the language of the Covenant is not foreclosed. This has never been my intention. My intention is not a boundariless communion of decentralised Churches, and surely this is the origin of a failure to agree common standards so far of which the Chicago-Lambeth Quadrilateral was a clear counterpointer. The extension of this letter to all bishops is indeed an extension of this very point, to examine the dissimilarity of view which can be discarded, and to find forms of agreement by which those who disagree cannot weaken the central mission upon which we as the included should all be agreed in the manner in which we agree it, namely the basis on which the Bible is read and the expectations we have, each to the other, on this fundamental - even fundamentalist - hermeneutic that we should jointly affirm. Recently I have made it clear that if I could not read some key narratives historically or that the history was in some way disproved I would stop being Archbishop, would cease to celebrate the sacraments, would advise that we have no more Archbishops (or bishops for that matter) and I would add here that I would advise that we should close down the whole worldwide Anglican Church. If as a bishop you have difficulty with your meeting these expectations of the approved biblical hermeneutic of the worldwide Anglican Church as just outlined I respectfully suggest that you consider your attendance at the Lambeth Conference. There is further the difficulty of the qualified episcopal system, and whether by Conventions or by synods, we are not recognising an inadequate charism of the bishops in dioceses, and so I propose that the purpose of the Covenant proceedings will be to override such qualifications that are negatively extant to the proper charism of bishops in order to affirm a full Church Order that can centre upon the place of the Archbishop, the primates, the Lambeth Conference and the advices but not strictures of the Anglican Consultative Council. If as a bishop you have difficulty with your own charism in relationship to limitations and qualifications elsewhere I suggest again and respectfully that you consider your attendance at the Lambeth Conference. Let me reiterate that I have not felt able to invite those whose episcopal ordination was carried through against the counsel of the Instruments of Communion, and I still have not seen any reason to revisit this. However, I am grateful that the Global Anglican Future Conference is existing in preparation for the Lambeth Conference, but any of its activities that do not relate to the Lambeth Conference obviously fall outside of one of the Instruments of Communion and so should be of no concern to us. If you are a bishop going to the Global Anglican Future Conference as preparation for the Lambeth Conference then you may have no conscientious reason not to come to the Lambeth Conference, but you should nevertheless examine your own stance - but if you are going to attend to matters lying properly speaking outside the Instruments of Communion of the worldwide Anglican Church and do not intend to come to the Lambeth Conference, then I conversely ask you to search your conscience whether you should in fact not be coming to the Lambeth Conference but actually should come within this Instrument of Communion as you would be able to advance the Covenant and use it to strengthen the worldwide Anglican Church. After all, you would approve of the hermeneutic standard regarding Holy Scriptures and of the authority of bishops, however understood. I understand that as an attender at the Global Anglican Future Conference you must read 1 Corinthians 15 and Romans 1 according to expectations of one diocese upon another, and that you do not intend to revisit the issues of Lambeth 1998 resolution 1:10, and therefore you could indeed attend Lambeth 2008. However, I reiterate that consecrations outside the the counsel of the Instruments of Communion forbid invitation at Lambeth Conference proper, though there may still be provision for extraordinary invitation or representation or attendance in the market area alone. I hope this brings some clarification to the situation. If you feel you are unable to attend, please send the reply slip contained at the end of this letter to one of the Instruments of Communion, or send a message by email in the same direction. On a personal note, my friend Bishop Tom Dunhelm stated that these letters (including this one) were in the post. He was only partly right in that they might have been but they were not. I take his advice seriously as he is a good friend, and this reflects some suggestions he gave me as to how to make the numbers more manageable in order to stitch something up if we can. As I examine the arguments I have to suggest that it is possible that I may not be there, nor the charismatic and risk-taking Archbishop of York, but if we are not then Tom can run the show, which is what he wants to do. I know how important is your decision is to stay away or come, but, just as we consider all minorities, and praying for them, including praying for bishops attending or not, I nevertheless ask you especially to pray for the Lambeth Conference in whatever it is trying to do. Mar Diwinydd, Archbishop, Patriarch of the Western Anglicans. A New Use for Psalm 119! Why Do the Police Do This?